We are happy to welcome you to the TommyCard Rewards Program. A world of exclusive benefits awaits you. You will be rewarded with HUGE savings off your next vehicle purchase, convenient and money-saving service advantages, exclusive discounts at local merchants, and so much more. You’re gonna love it here! When you choose a TommyCar dealership, you can reap an array of benefits from our TommyCard Rewards Program. From our Best Price Match Guarantee and guaranteed lowest tire price to towing discounts and a referral bonus, the list of TommyCard perks goes on and on. 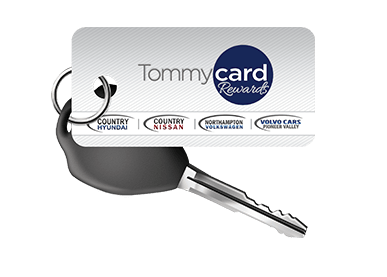 Learn more about the TommyCard Rewards Program then visit one of our Western Massachusetts car dealerships to discover big Nissan, Hyundai, Volkswagen and Volvo savings! Use your TommyCard Rewards card or key tag on every visit and earn 15% of every dollar you spend on qualified purchases. You can rack up as much as $2,000 toward the lease or purchase of a new Nissan, VW, Hyundai or Volvo! Every customer will receive $25 in Bonus Points when purchasing or leasing their first new or used car from us! All TommyCard Rewards members will receive $25 in Bonus Points when their membership is activated at their first service appointment. Purchase and install any set of four (4) new tires with your TommyCard Rewards card or key tag at Volvo Cars Pioneer Valley, Country Hyundai, Country Nissan or Northampton Volkswagen. Then, you'll receive an additional $50 in Bonus Points. Plus, you'll still get the 15% reward! You can earn $100 in Bonus Points for each person you refer to TommyCar Auto Group who purchases or leases a new or used vehicle. You can refer an unlimited amount of people; you just need to complete one of the referral forms below. Our Best Price Guarantee promises you that we’ll beat any advertised price on a new vehicle by $250 or we’ll give you $1,000! Members always pay the very lowest price on parts, labor, service and accessories. Just ask us for details. Enjoy hassle-free appointment scheduling. TommyCard Rewards members always receive first priority when they schedule auto service in South Deerfield, Northampton or Hadley, MA. TommyCard Rewards members can enjoy complimentary shuttle service anywhere within 15 miles of the dealership! Enjoy a complimentary car wash every time you get auto service at one of our car dealerships near Chicopee, MA. Travel with peace of mind around Northampton and beyond thanks to the complimentary 27-point vehicle inspection you’ll receive with service as a TommyCard member. We believe in supporting our local communities. For this reason, we have launched our "Keep It Local" Merchant Partnerships. When you support our local businesses and present your TommyCard Rewards card or key tag, you will be rewarded with exclusive everyday discounts! Contact your local TommyCar dealership for a list of our VIP Partners and their offers. Get up to $100 towards your towing bill when auto repairs are done at any of our TommyCar locations! If your vehicle is inoperable and in need of a mechanical repair, members will be reimbursed up to $100 of any out-of-pocket towing bill charged to you for transport of your vehicle to any TommyCar Auto Group location. At time of vehicle drop off, please present your service advisor with a copy of your towing bill and a valid membership card or key tag. Once the towing bill has been verified and all repairs complete, you will receive a discount equal to the amount of the towing bill (not to exceed $100) off your final repair bill. Reimbursement available to members that have their repair work completed by a TommyCar Auto Group location only. At our MA car dealerships, you have our promise that you will receive the top price for your trade. We provide trade-in offers based on the current market value. We will purchase any car, whether you are buying from our dealership or not. Drive your trade-in to our dealership and speak to one of our appraisal experts! As a TommyCard Rewards Member, you will receive an extra $500 when you trade in your enrolled vehicle for your next new or pre-owned vehicle as long as 100% of your factory-recommended services were completed by our service department. Members always go to the head of the line. As new products are introduced, TommyCard Rewards members are invited to special VIP product introductions and test-drives before anyone else. Throughout the year, members receive exclusive e-mail offers and savings from both inside and outside the dealership reserved for our top guests. Enjoy special members-only pricing and offers on new and pre-owned vehicles, parts and service specials, contests, giveaways and much more. In order to receive updates on these exciting offers and specials, each member must have a valid email address on file. To update your email address, please visit www.TommyCarAuto.com. When you earn reward points, you'll also be earning points to future FREE services at any of our TommyCar stores. When a new reward level is reached, you will automatically receive a gift certificate toward future service at TommyCar Auto Group. We plan numerous contests and promotions for our customers throughout the year. It is our special way of saying thank you for swiping your TommyCard Rewards key tag or card in our auto service department. Simply remember to swipe to qualify for our current promotion and then check out your personal message printed on your receipt. If you've earned points but you’re not ready to purchase a vehicle, then you can transfer your points to an immediate family member in the same household or transfer them to charity (Tom Cosenzi Driving For The Cure Charity Golf Tournament). Simply complete our form below and we will contact you to verify the transfer of your points to the immediate family member of your choosing. Remember, points can be transferred and used as a direct discount on a qualifying vehicle. Points cannot be transferred from account to account and they must be redeemed towards a vehicle prior to their expiration date. $10 OFF any class package or monthly membership! TommyCard Rewards members are invited to enjoy half-price appetizers! 10% OFF any drop-in class purchase! 15% OFF any class card purchase! $5 OFF our Beginner Class! Must be at least 13 years old to take the class. Registration required. Must sign liability waiver. Anyone under 18 must have their waiver signed by a parent or legal guardian. One FREE child admission with the purchase of one adult admission! 15% OFF services and retail! FREE 7 Days of unlimited training! 10% OFF all memberships and 10% OFF all class packs! Valid on in-stock items only. Excludes special orders. 10% OFF any body or paint repair! 10% OFF your gift card purchase! One FREE small order of chips with your entrée purchase! 15% OFF $20 or more! 10% OFF regular priced EFT memberships! -OR- 10% OFF one month! 10% OFF boarding, grooming or daycare! Buy one race, get one FREE! One per person, per day. 15% OFF your total on-line purchase! Use code TommyCar at check out. 5% OFF towing and road service! BOGO FREE Thunderbirds ticket in the attack or defense zone for any regular season game! April 13 and 2019 All Star Classic excluded. Limit 4 per customer, per game. Tickets must be purchased at the MassMututal Center Box Office or the Thunderbirds office. 10% OFF gift card purchases! $5.00 OFF $30.00 or more! 20% OFF the Agawam playing field! $20 OFF your purchase of $45 or more! Excludes personalized candles, Woodwick®, Chesapeake Bay Candles®, Elevation Collection®, Alex and Ani and sales center merchandise. Offer valid only at Yankee Candle Village MA. Not valid on previous purchases. Not redeemable for cash or gift cards. One coupon code per transaction. $100 OFF any order of $999 or more! All offers exclude alcohol. Offers not valid with any other promotion or discount. Merchants not liable for any misprints. All offers expire 11/30/20. Valid Rewards card required. See participating merchant locations for additional details. No cash value. If you’re not ready to purchase your vehicle, you can transfer your points to an immediate family member in the same household or transfer to charity (Tom Cosenzi Driving For The Cure Charity Golf Tournament). Simply complete this form below and we will contact you to verify the transfer of your points to the immediate family member of your choice. Remember, points can be transferred and used as a direct discount off a qualifying vehicle. Points cannot be transferred from account to account and must be redeemed towards a vehicle prior to their expiration date. 1 Must be exact match (brand, tire size, load rating and speed rating) and include mounting and balancing of tires. 2 Offer valid on major services totaling $75.00 or more. Based on availability. Must schedule an appointment in advance. Limit of 2, 1-day loaners per member per year. 3 Please be sure to mention this to the service advisor upon check in. Discount cannot be combined with other special promotions. Senior discounts available to customers 65 and up. 4 Must take delivery of second TommyCar Auto Group vehicle to apply. Must present lease end invoice within 15 days of receipt. Restrictions apply. May be canceled or terminated at any time.